The available factory-installed spray-on bedliner adds a permanently bonded layer to your cargo box. Thick, water-sealed and finished with the Chevy bowtie, it’s an effective way to help prevent damage to the backbone of your truck. Keep your cargo secure with available upper and lower tie-down hooks rated to secure up to 250 lbs each. Reconfiguring your setup in the dark? Available LED bed lighting enhances visibility. 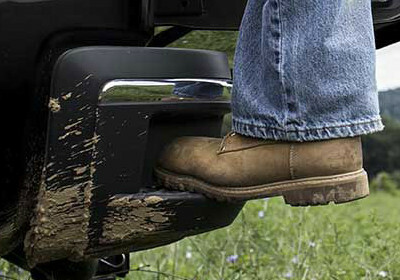 Get into and out of the cargo box with ease thanks to this ingenious, class-exclusive feature. When you’re pulling a heavy load, the last thing you want to be thinking about is whether or not you’ve got enough power. That’s why Silverado HD offers towing technologies designed to help you haul with confidence. 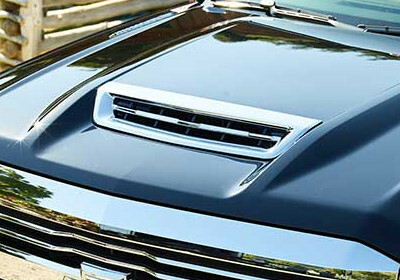 We reimagined the hood on Silverado HD diesel models with functional vents that enable easier, more confident hauling and trailering. 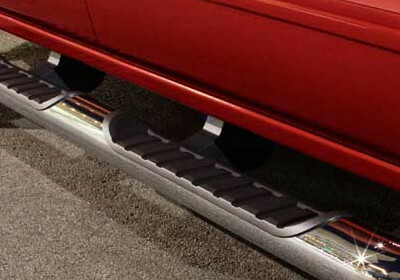 Enter and exit your Silverado HD more easily with these handy Assist Steps featuring textured step pads. Step up to great-looking Chevrolet Assist Steps which are engineered specifically to get you in and out of your vehicle with greater convenience. Whether you’re spending the day on the road or just need a quiet spot for making hands-free phone calls, Silverado HD offers a cabin with the perfect mix of comfort and capability. Chevrolet MyLink® organizes and integrates your technology so you can enjoy every ride. Make and receive calls, get text message alerts† and enjoy other convenient features — all while keeping your compatible mobile device stored away. Keep your eyes on the road with Siri Eyes Free,® available for compatible iPhone® users. The system enables hands-free interaction for composing important messages on the go. Get real-time updates on fuel prices at nearby gas stations, up-to-the-minute weather reports, information on traffic, speed and accidents, and more with SiriusXM® Travel Link, available through Chevrolet MyLink® with a three-month trial.